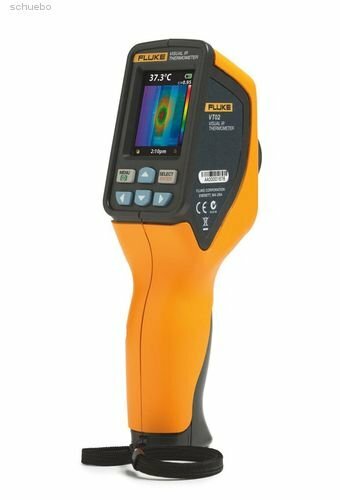 The Fluke VT02 is a hybrid of a thermal imaging camera and a infrared thermometer. In practice, the thermal image serves as a search aid to quickly measure temperaturs. The menu has been kept simple and is not overloaded. Learn more about the Fluke VT02! 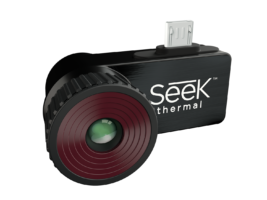 This thermal imaging camera (part number of the manufacturer: 4253599) has been designed for the workplace. The manufacturer describes the device as a “visual infrared thermometer”, which makes it clear that the focus of the functions is on the spot measurement. To facilitate this, a thermal imaging sensor and even a visual digital camera have been integrated. It is possible to record both image sources on the SD card. The device is not overloaded with unnecessary functions and can be operated and configured with ease. With the on / off button on the left side, the menu can be opened. The date, time, background temperature, temperature units, markings, emission value and the color palette are displayed. To navigate between the options, use the up / down buttons to select items with the “SELECT” button. At the front is the trigger, which triggers the image recording. A cord is supplied, which can be threaded in an eyelet at the bottom of the handle and allows wearing on the wrist. Even a mounting on a tripod is possible due to available tripod connector. It is also nice that the lens can be protected with a rotatable cover. On the display you can see the temperature in the measuring point. The measuring marking can be inserted or dimmed if wanted. The time is displayed at the bottom and the configured emission value and the battery status are shown at the top right. The visual image and the thermal image are combined internally into an blended image. However, the thermal imaging camera must know how far it is from the object. The user can do this with the Fluke VT02 simply via two front buttons ( “NEAR” / “FAR”). It is a close-up when the distance is less than 23 cm. The emission level can be adjusted very flexibly in 0.01 steps from 0.10 to 01.00. Setting the background temperature between 0 ° C and + 36 ° C will additionally improve the reliability of the displayed measured value. A function ( “temperature marking”) has also been integrated, which marks hot or cold areas separately in the thermal image in real-time. This is useful to save time when analyzing. In addition, there is the already mentioned function to overlay thermal image and visual image. This setting is configurable in 25% increments. The range of temperatures is adjusted automatically by the camera. Overall, the micro SD card according to the manufacturer can store up to 10,000 pictures. These are stored in a proprietary format ( “is2”). Temperature detection is carried out by a pyroelectric ceramic sensor in a temperature range of -10 ° C to + 250 ° C (14° F to 482° F) with an accuracy of ± 2 ° C or ± 2% of the measured value, whichever is greater (at 23 ° C (73,4° F) nominal temperature). The camera operates with a fixed focus from a distance of 50 cm and an image recording frequency of 8 Hz. The thermal sensitivity of the sensor is less than 250 mK in a spectral range of 8 μm to 14 μm. The sensor of the visual camera has a resolution of 11.025 pixels and is displayed with a FOV of 20 ° x 20 ° on the 2.2 inch display. The field of view of the digital camera is 29.8 ° x 22.6 ° with a focal length of f = 7.5 mm of the standard lens. Thus, it can be used relatively universally inside and outside. The minimum focus distance is 20 cm for the IR image. The focus itself is set manually via a rotary wheel. The weight is approx. 300 g with dimensions of 21 cm x 7.5 cm x 5.5 cm. The batteries are simply placed in the provided compartment after removing the battery compartment cover from the handle of the thermal imaging camera. According to manufacturers, the 4 AA batteries have an operating time of 8 hours. A software is provided for creating reports and post-processing the images. This application called “SmartView” is also used by the manufacturer Fluke for its other thermal imaging cameras. For mobile use, there is an app for tablets. A special feature is the IR fusion technology, which can be used to overlay the thermal image and visual image. Fluke recommends the use of the VT02 by electricians and maintenance personnel. It facilitates the detection of problems and can produce precise thermal measurements. Another possible application area is heating installation or building technology. In principle, there are no limits when using the VT02, especially as it is equipped for different distances and wide temperature ranges. 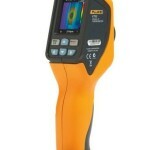 The Fluke VT02* is a cost-effective mixture of thermal imaging and infrared thermometers. It is fully designed for everyday use without much frills. The detectable temperature range and the cross-fading function are good. The included SD card stores many recordings. Overall, the displayed thermal image is to be understood as a search aid in spot measurement, since the resolution is relatively low. Nevertheless, you can carry out more accurate analyzes with the appropriate software.